Slice 1 onion into thin, half-moon slivers, toss with (1-2 Tbsp) olive oil to coat. Slice 1 onion into thin, half-moon slivers, toss with (1-2 Tbsp) olive oil to coat. Sprinkle evenly with salt . Heat a non-stick skillet over medium heat and cook for 10-15 minutes stirring and shaking the pan a few times. Get creative and add a little wine or brandy to get the browned bits from the bottom of the pan. 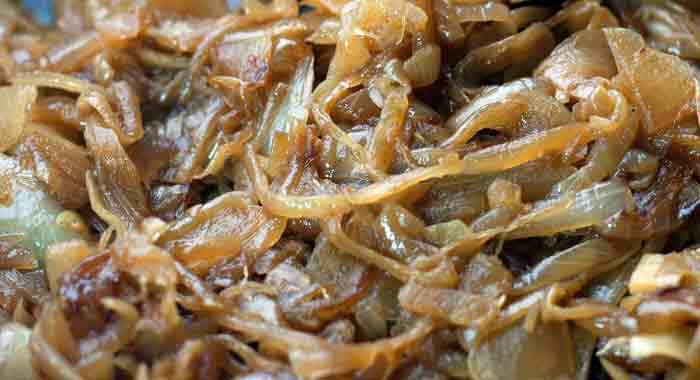 This entry was posted in Article, Tips, Vegetables and tagged carmelize, How to, onion by foodies4mmc. Bookmark the permalink.